A simple mod to improve AIs, increase performance, and give more control over AIs. With the core goal focused on reducing CPU cost of large sums of AIs. AI Improvements was born out of the need to improve server performance for large heavily modded servers. As any experienced server owner will know a server's CPU clock time is eaten away by mods all trying to fight over resources. Most server owners and developers will try to attack this problem by trimming mods. Rather than going after the mods installed I started to look at Minecraft itself. Focusing down on how it was designed to work and how it lent to performance problems. I found that as a server's population grows so does the amount of entities and other resources. At first, I thought "lets reduce the spawn rate of mobs on the server" this lead to a complaint about mob farming. Even with testing, it didn't show a major solution to the problem. So rather than taking that approach, I decided to improve how the AI's function. This resulted in a lot of resource and insight into different areas. After many hours, I found my solution and created this mod. I installed but didn't see a large gain as promised? Newer versions of MC implement fixes for the AI. With the last few versions, the rotation fix was implemented in addition to other fixes. Thus, the impact of this mod is much lower than in older versions. Can this be installed on the server only? Can this be installed on the client only? Yes, though it may not do much to improve fps. What will happen if I disable the EntityLookHelper replacement? You're not going to see much of an improvement in the AI code. However, if you enabled the other disable configs it should be fine. How does this mod work for fixing performance? By default the config is set to false and will not do anything. When changed to true it will remove an AI segment called EntityAIWatchClosest. This AI segment handles the coded AIs use to rotate their head towards a nearby entity.Visually this will cause a few odd issues. However, for the CPU this frees up a lot of usage caused by entities. By default the config is set to false and will not do anything. Setting the config to true will cause entities to no longer use the 'look idle' AI code. This can improve performance for servers will large populations. As almost every entity on the map will use this when not doing anything important. Visually this can cause the entities head to not rotate sometimes but mostly goes unnoticed. This is the main feature of the mod and can greatly improve CPU performance at a small cost to RAM. How this works is MC's look helper code is replaced with a custom version. The custom version stores some data that makes it faster to get the angle for a location. Threw some testing with VisualVM result have shown a 50% to 80% decrease in CPU usage by the AI code. For a server with 25 people on constantly this resulted in a gain from 5 to 7 tps. It is also recommended when making modpacks to make this mod optional. As it is primarly designed for server side use and provides only a small boost to client side. As much as I'd like to use this mod the word unstable isn't a word I like when I decide whether I do or don't want this added to my mod list. Seeing as the mod hasn't been updated in 2 years, begs the question, when will a stable build be released, if at all? Just curious is all. unstable is just something added to the file by out automated build systems. Unlike the site our team uses two release streams. Forgot to add, we do plan to change this at some point. As automated builds were never meant to be the main release system. However, with lack of time it has become our main system of release. So we might be switching over to something like 'nightly' or 'weekly' in place of unstable in the file names. As that is what they are 'weekly' builds. Assuming we have changes to build. As for stability the mod is rather safe and well tested. The biggest concern is installing it with other mods that overlap the look helper in MC. Since we replace it in mobs it can have unexpected side effects depending on usage. However, we do check for existing changes before applying our own so it should not effect custom mobs that change the look helper. Thank you for this mod. Is here any kind of no-compatibility with https://minecraft.curseforge.com/projects/animania (new Vanilla animals/new AI-behavior) please ? In theory it will work on any mob that extends the base mod type. Hey. Thank you for your answer. I will test it on my server (1.12.2/175 mods) and will give you some feedback. Would this cause an issue if used alongside Zombie Awareness? In theory no but it has never been tested. Right now the mod only changes a few simple math functions to improve over all performance. The actual AI overhaul stuff is only in the 1.7 version and has yet to be finished for 1.12. Everything can be toyed with in the configs and nothing uses ASM. It all in code changes and replacements of AI tasks. Worst case Zombie Awareness uses its own LookHelper which we replace. IF this is the case then AI improvement will not run on entities that have been modified. It does a special check for the vanilla version before replacement works. Alright, thanks. I'm going to try it and see what happens. in 1.12-1.12.2 (other versions I'm not sure) mobs of all kinds attempt to pass through walls if there is a diagonal block pattern. Block pattern on a grid: (0,0), (1,1), (2,2), etc. Does this mod fix this / could you update it to fix this? 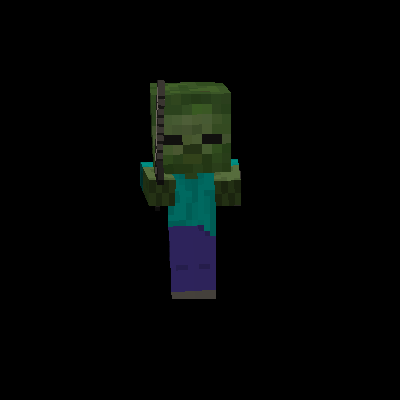 Will this allow me to make zombies and husk attack modded mobs like bandits from vics warfare mod? Nope but could be something that I can add. The main purpose of the mod is to adjust AIs and improve performance. Will this conflict with CoFHTweaks' AI optimizations? Did this will conflict with other mod named " Zombie Awareness" ? or they both could work perfectly or is better to have just one. Or they do "almost" the same thing? Exactly what I'm wondering, gonna give it a shot to see if it breaks Zombie awareness. Ya it should work well with most mods as it only modifies the look handler. Very few mods mess with that object on vanilla creatures. That being said the newer stuff does include features to disable or adjust more AI code. Which could impact other mods if enabled (said feature is disabled by default for this reason). Yes, works great in 1.12.2.